By FIRST DOWN DASH SI 105 (1984). World champion. Sire of 1,502 ROM, 235 stakes winners, $78,962,220, 35 champions, including OCEAN RUNAWAY SI 105 ($1,642,498 [G1]), CORONA CASH SI 101 ($1,542,880 [G1]). Sire of the dams of 201 stakes winners, 9 champions, including GOOD REASON SA ($1,446,727 [G1]), APOLLITICAL TIME SI 104 ($904,242 [G1]), OLD HABITS SI 106 ($680,491 [G1]), FEATURE MR BOJANGLES SI 103. MAYBEINTYME SI 102, by The Signature. 7 wins to 4, $52,735, James Smith Memorial H. [G3], Gil Gilliland S., 2nd QHBC Marathon Classic [G3], 3rd Pat Hyland Memorial H. [G3], Bull Rastus H. [G3], AQHA Distance Challenge 4. Dam of 8 foals, 5 to race, 3 ROM, including– First Down Tyme SI 80 (c. by First Down Dash). Winner to 3, $8,090. Coronaintyme SI 83 (f. by Corona Cartel). Unplaced. Dam of– BLAZINTYMESI 85 (f. by ChicksABlazin). Winner in 2 starts at 2, 2012, ($5,737 USA), in Mexico, Premio Project Runaway B Futurity. SPLIT SECOND AWAY SI 82, by Reb’s Policy TB. 3 wins to 3, $6,250. Dam of 12 foals to race, all ROM, including–SECOND TIME AWAY SI 104 (g. by Casady Casanova). 11 wins to 6, $134,398, PCQHRA Breeders’ Derby [R] [G3], Bay Shore Juvenile S., 2nd PCQHRA Breeders’ Futurity [R] [G2], Spencer Childers California Breeders’ Champ [R] [G2], 3rd Lakeside S., finalist [G1]. MAYBEINTYME SI 102 (f. by The Signature). Stakes winner, above. Hadd SI 98 (c. by First Down Dash). Winner to 3, $15,945, 2nd The Classics Futurity [R]. ETTA ANGEL, by Ettabo. Half sister to BOBBYS ANGEL ($162,151), BAND OF AZURE SI 98 ($52,414); out of BAND OF ANGELS SI 95 (Champion 2-Year-Old Filly). Dam of 2 other foals to race, incl.– Miss Easy Etta Angel SI 90 (Real Easy Jet). Placed to 3.Damof Second Effort Champ SI 102 ($42,265, 3rd Silver Dollar Futurity [R] [G1]). Locker Room Lady is an own daughter of the great First Down Dash. She’s a nice, big mare standing 15.2+ with a great wither and girth. 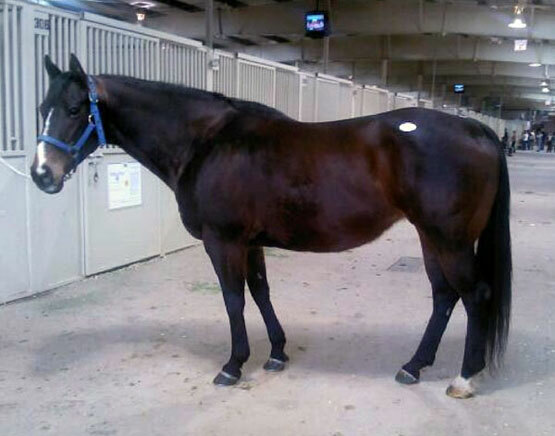 I just love the hock-set on this mare. She floats when she moves but looks like she could shorten up and change directions in one stride too. She’s very balanced with a nice sloping shoulder and slim neck. I love that she’s got Reb’s Policy and Band of Angels on the bottom side of her pedigree. She had a nice Sixes Royal colt this spring for us & she’s bred back to 99. Niners had crossed wonderfully on any of the First Down Dash kind of mares in the past, so this ought to be a real nice cross!! !